I have an existing brick landing at my front entrance and I'm considering building a new front porch over it. Any tips? A new front porch can do a lot for a home! If done right it can greatly improve curb appeal. In bad weather, it can provide shelter for arriving guests as well as protection for your front entry door from rain, ice, snow and the blistering summer sun. Further, depending on the size and setting, it can be a great place to sit and relax. There are a number of factors to consider before diving into a front porch project. Probably the most important is design. A new front porch can look like a cheap addon if not properly thought out. When properly designed, however, it can greatly enhance your home's appearance and should look like it was an original part of the house. Things like post style/size, colors, roof type and pitch, decorative moldings, railing style, ceiling covering, etc. can all come into play and need to be considered. It's important to work with a contractor who will take the time to help you work through the design. He/she should be able to provide you with design elevations that allow you to see what the porch will look like before you start. Ask them to show you before and after photos of other porches they've built. Depending upon the complexity of the porch it may be necessary to bring in an architect or design professional if your contractor doesn't have these capabilities in–house. Trust me on this, it's worth the time and money up front for a proper design to make sure the result is what you want! Another item that needs to be considered is a proper foundation for your porch. It's likely that the foundation for your existing landing is sufficient to support your new porch, but that will have to be investigated. If your landing is a "floating pad" or doesn't have a properly sized foundation for your porch there may be some foundation work required. If so, you may also want to consider enlarging your porch, assuming a larger size would work with the design of your home. Finally, various municipalities and some homeowner's associations have rules and regulations concerning porches, mostly related to property line setbacks. There are also regulations concerning the percentage of "impervious surface" lot coverage. If you have a smaller lot this may come into play, particularly if you're planning to enlarge your porch. So it would be a good idea to check with your municipality and/or homeowner's association and make sure that you will be allowed to build a new porch before you get too far into the design stage. As with the design, a professional contractor should be able to help you through this process as well. At Eby Exteriors we are porch addition specialists and have built many beautiful new front porches as well functional, attractive screened–in porches and sunrooms. Don't hesitate to contact us if we can be of assistance in any way! What are my options in low–maintenance decking? Low–maintenance decking comes in a variety of options, each with a different cost, aesthetic quality, durability, and required maintenance. As decks are a permanent addition to your home, selecting the right one is important! The three most common varieties of low-maintenance decking are pressure-treated wood, composite, and PVC. Pressure–treated wood. Pressuretreated wood is the most affordable low–maintenance decking option. It offers the aesthetic feel of a natural wood deck with less danger of mold, rot, and decay. It is created by dunking timbers into a protective treatment of liquid chemical preservative. The wood is then placed in a high-pressure chamber to push the treatment deep into each board. Pressure–treated wood requires regular maintenance and should be treated with a stain or water repellent after installation and on a yearly basis afterward. Composite. Composite decking is made from a combination of wood and plastic. The wood allows the material to mimic the grain of traditional wooden deck boards, while the plastic makes the material strongly resistant to weather and water without requiring staining or sealing. In some extreme climates the material can retain heat, creating an uncomfortable environment for bare feet or the possibility of warping. Some composite decking is capped, or covered with a solid protective layer of synthetic material. Capped composite decking is further protected against warping, fading, or damage, making it a durable decking option. PVC. PVC decking is a completely synthetic material, and therefore contains no wood. Because it is made of plastic, a PVC deck is extremely durable and long–lasting. The boards stand up to moisture, weather, sunlight, and everyday wear and tear better than any other decking options. Because it is totally synthetic, PVC decking does not have the same aesthetic appeal as natural wood. The deck will not require sealing, staining, or waterproofing. This is the most expensive decking option in terms of upfront cost, but it can be a cheaper long-term investment, as it will not need maintenance or replacement as often as other decking options. So, to wrap up, here's a summary. If you have questions or would like to learn more, feel free to reach out! Call us at Homestead Outdoor Products, 717–656–9596. We're happy to help. My wife and I have done extensive remodeling to the inside of our home and now it's time to move to the outside. What can you tell us about exterior painting? Now that you have the interior projects finished—yes, a good starting point for the exterior is probably the same place you found yourself starting on the inside of your home—paint! One of the best ways to spruce up a home's exterior is a fresh coat of paint. And, even though you may not be looking for extra work, most exterior surfaces can, in fact, be painted—including vinyl and aluminum! Many people don't realize this, but by painting vinyl and aluminum you can add a whole new look to your house. You have to make sure your vinyl and aluminum are in good condition first, or else you'll be wasting time and money, and paying a professional painter is definitely more cost–effective than complete replacements. But even beginners can usually tackle painting jobs such as this, so by only spending out-of-pocket cash on paint and supplies you can save a lot of money. As with all painting projects proper preparation, including a thorough cleaning and power washing, is very important. I recommend using a low-sheen or low–luster paint, because it will shed dirt and not show small dents and imperfections, but when painting vinyl be sure to use a vinyl safe paint that is approved for use on vinyl. You can also try to use a spray applicator (for a smoother appearance) but brushes and rollers work great, too. Choosing your paints—choose wisely! Different projects and surfaces often require specific products and exterior painting is no exception. Allow me to address three different surface types for you here. Painting Brick. With brick surfaces, you need to clean and power wash for good adhesion, then prime with a high quality masonry primer tinted to the finish color. Finally, apply a100% acrylic latex low luster paint with a medium nap roller. Wood. If the wood is bare, prime it with a latex exterior primer and then finish it with one or two coats of a 100% acrylic top coat. If the wood has been previously painted, it should be properly prepared, spot primed and then finished with one or two coats of 100% acrylic top coat. Decks and Fences. The best way to update deck or fence areas is with an exterior stain, and depending on the look you want, there are several options. To see the most grain, use a transparent or semitransparent stain; for less visible grain, use a semi-solid stain; and a solid color stain will provide a solid or painted look. Just keep in mind that the more solid the color, the longer the stain life, so transparent and semitransparent stains may need to be recoated after a few years of direct exposure to sunlight. Flat paint? Gloss paint? Is there really much difference? Amateurs and pros agree on one important thing: in order to "walk the walk" you need to "talk the talk." Paint sheen, for example, refers to the amount of gloss a paint possesses. Generally, there are three "sheens" used in exterior paints. • Flat–little or no sheen; commonly used on stucco or plaster, or on wood siding for a more rustic look. • Low luster–slight sheen; used on larger siding surfaces, it will not show all imperfections. • Soft gloss–semi gloss sheen; used on trim, doors, posts etc, for an accent look and easy cleaning. • Use only top quality paints. They will save you time and increase the life of the job. • Use a high grade brush designed specifically for today's paints. • Be sure the surface is clean and dry. • Sand or prime glossy surfaces for better adhesion. • Do not paint in the direct sunlight. • Spot prime bare surfaces. • Use a primer tint that's close to your finish color—because it may save a coat of paint. For your project, don't forget that your front door makes a huge first impression. To choose the best color possible and avoid having to repaint if you don't get it right the first time, here's something a friend in the industry told me several years ago. Print a photo of your house, and then cut out the front door. By placing different color samples behind the photo you can easily see how each one will look—BEFORE the first brush stroke! Remember, when it comes to a house, beauty is often "skin" deep, so by repainting the exterior you can enhance the overall look of your home and make it stand out. Plus you'll increase your resale value! For affordable prices, exceptional service, and the largest selection of premium quality Benjamin Moore paint in Lancaster and Berks County, visit one of our three convenient locations. We recently had our front door replaced and were very surprised when the contractor discovered a significant amount of rot in the house frame underneath the door. We had no idea! And the repairs added about $500 to the cost of our door replacement. Now I'm worried that I might have more unseen damage throughout my house. What can I do to find out? As a replacement contractor we find problems like this all the time. We'll replace a roof, some windows, or a door, for example, and discover rot, and often with it—mold. The fact is that a visible leak is much better than a hidden one because it is noticed and addressed. Hidden leaks can sometimes occur over a period of years before they are discovered and then there is often a large repair bill, not to mention the bad air you may have been breathing due to mold growth. Hidden leaks/moisture problems can happen all over your house and can come through areas such as the roof, exterior cladding (siding, stucco, brick, etc.) and windows & doors. Other problem areas can include bad gutters, foundation and landscaping issues, and lack of proper attic ventilation that leads to condensation. Most typically the hidden leaks that we find are the result of poor craftsmanship. For example, installing a single nail at the wrong place on a roofing shingle may not seem like a big deal, but in a few years, after the nail rusts, a leak can develop that isn't discovered until part of the roof deck is rotted and a section of attic insulation is ruined. Beyond shoddy installation practices, inferior building components, lack of maintenance, and Mother Nature simply doing her thing over time can all lead to hidden leaks. As a homeowner there are a few things you can do. Start inside by checking out your basement and your attic. Check for any signs of moisture like damp spots, water stains or matted insulation. Look for cracks on your foundation. Then go outside and look at the landscape around your house to see if it is sloped away from your foundation or if it is actually funneling water toward your house. Examine the gutters and take note if any of them are pulling away from the house or if they are clogged or have standing water in them. Take a look at your siding, windows, and doors. If you see areas that appear cracked or rotted there is a good chance that some water may getting in. If you discover some clear problem areas or suspect areas then call a reputable contractor and have them take a look. They will be able to make recommendations for repairs or further investigation. Finally, if you're not comfortable checking things out on your own hire a reputable contractor or home inspector to do an inspection for you. Most leaks, if discovered early, are easily remedied. This could save you hundreds (as you have learned) and even thousands of dollars down the road. If you'd like to learn more you can check out our website, ebyexteriors.com or waterkillshouses.com. We also are offering our "Exterior Envelope Inspection" for only $99. Feel free also to call us at 733.9142 or come visit us at our Akron showroom. We'd also be happy to visit you at your home or place of business. And, as always, we offer free, no obligation quotes. We have been looking to purchase a home and recently found one that is exactly what we've been dreaming of but we have a concern with the roof. On the back side of the house the shingles have some ugly black streaks on them and we are not sure what it is. Should we be concerned? Sorry to be an alarmist but, YES, you should be concerned...very much so! In addition to being unsightly, black streaks on shingle roofs in most cases, are a form of algae that typically grows on the north side of buildings or in shady areas. If left untreated, the algae can lead to mold or other nasty stuff including fungus, lichens, and moss. All of which can shorten the life of your roof not to mention a potential hazard to your health. Now that I've got your attention, I should point out that in situations where you are only seeing light streaks, there probably isn't a health concern. Having said that, however, as algae grows it decomposes and then you run the risk of potential mold which can become a very LARGE problem. The biggest problem with the algae is that as it grows, the roots grow into the roof shingle and loosen the protective granules from the shingle. The roots can also work as a wick and transfer moisture into the home. This will cause rotting and potentially cause mold to grow inside the home. Also as the algae grows and decomposes it holds moisture and acts as a magnifying glass from the sun's ultraviolet rays. Moisture, ultraviolet rays and thermo movement are the biggest enemies of roofs. All three of them are intensified as algae grows and that is what will cause an earlier then necessary roof replacement. It also gives your home a less attractive curb appeal. Considering the cost of a new roof (approximately $350 per square foot or an average of $8,000 per home), it makes sense to consider preservation options. The good news is that if your shingles are still in sound condition you can save your roof by having the algae and mold removed. To be done properly, this is a job for a professional roof cleaning contractor using a safe non-pressure washing system. Many homeowners are under the false impression that they can remove the algae and mold by simply pressure washing the affected areas. Truth be told, a pressure washer will only give the algae and mold a haircut. The benefit of using the non-pressure washing system is not only that it will remove the algae and mold–it will also kill the roots, preventing it from growing back. I feel so confident in our process that I back up that claim with a 5-year guarantee. This safe non-pressure washing cleaning system also works to clean siding, decks, patios, sidewalks and more. As for the cost of having algae and mold removed from a roof, the average home typically costs less than $500 and can be completed in just a few hours. We also offer a free roof inspection to let you know if the shingles are worth saving as well as how much it would cost you to have them cleaned. Another service that we now offer and that may be of interest to you is our interior mold remediation services. While mold on your roof is not a good thing, mold inside your home is a very serious health hazard that should be dealt with immediately. Similar to our free roof inspection service, we also provide free mold inspections to your home's interior–especially in the basement where mold is most likely to surface. From your roof to your basement, we literally offer top to bottom mold remediation services. For more information or to schedule a free inspection, please don't hesitate to call me at 717.739.5596. The 22–year old vinyl siding on my home looks terrible! It's faded, wavy, and cracked in some places. I know I need to do something about it but I don't want to go back to vinyl siding—are there any alternatives? As a consumer, you should be aware of all options available to you! Although not the only option, James Hardie fiber cement siding is an option that is "Engineered for Climate" to protect your home against the toughest of elements, providing an alternative that will outlast your current cladding and look better longer! James Hardie also provides a patented ColorPlus Technology that gives a breadth of color options, opening up design options to enhance curb appeal and last on the wall! Re–siding with James Hardie can transform the look and feel of your house and most importantly, keep it looking beautiful for years to come! Aesthetic/Maintenance Benefits. James Hardie fiber cement siding consists of a proprietary blend of cement, sand, cellulose wood fibers, and water, when combined, create a highly durable alternative to vinyl siding. James Hardie fiber cement siding offers the look and feel of traditional wood siding, without the durability or maintenance cycles of real wood! Cost Benefits. The long -term durability and savings from re–sides in the future make fiber cement siding worth the extra initial cost vs. vinyl and can actually add value to your home! For the 8th year in a row, re–siding with fiber cement siding has been named the #1 Return on Investment by Remodeling Magazine in their annual "cost vs. value report" and also has the Good Housekeeping "Seal of Approval!" James Hardie offers a product that is non–combustible, rot resistant, impervious to termites, resistant to shrinking/warping, resistant to wind, hail, snow, and sun, with a 30–year warranty giving many advantages over vinyl siding. For more information please visit www.jameshardie.com or contact Lancaster County's only James Hardie PREFERRED REMODELER, Eby Exteriors, Inc. at 733.9142. My wife and I will be purchasing a home soon and we both like the rustic look of log homes or those with natural wood siding. We understand that these types of homes require periodic maintenance to preserve the wood and its beauty. What do we need to know? Answer provided by: Rick Atkins, Lead Consultant, Atkins Deck Treatment Service, Inc.
years in the Lancaster area and over the years we've answered a lot of questions on the subject. Since your question is fairly generic, I'll share with you the most common questions we hear from our customers while we are giving them a free consultation at their home. How do you take care of our log or cedar home? We have several cleaning methods for log and cedar homes depending on the situation of the current stain application to the home. The most common way to clean the home is by applying a peroxicarbonate based cleaner to the home and then lightly power washing to remove mold, mildew and dirt from the home. You do not want to use a chlorine bleach to clean the home as the chlorine will break down the lignin in the wood causing it to become very fuzzy. A wood brightener is then applied to the home after the peroxicarbonate if the wood is dark, especially cedar, this will lighten the wood for a more natural color and remove tannin staining, the dark streaks on the wood. The other type of cleaning that we use is to media blast the home. Media blasting is sand blasting except we don’t use sand. The media we use is either crushed glass or corn cob depending on the surface. We use this method of cleaning if there is a very hard shell type of stain that is peeling, or if there is a lot of air leakage through the logs, or the owner tells me that the last time someone power washed the home water shot through the logs and got everything inside wet. After the home is cleaned it may need to be sanded prior to staining. Once the home is ready for staining we mask off all window and doors then apply two coats of Gemini TWP semitransparent oil stain to protect the wood for many years. How often does my log or cedar home need to be re-stained? Depending on what product is used it can be every year with some products or as long as 10 years with a solid stain. The typical time frame with a good semitransparent stain like Gemini TWP will be about every 5–7 years depending on the location. I can feel drafts coming through my logs—what can be done to stop it? Typically what needs to be done is to chink along the log joints to seal the logs which will stop air and water from entering the home through the logs. The carpenter bees are eating my home—what can we do about it? Depending on how much damage the bees have done to the wood we can take care of the problem several ways. If the damage is not too severe we treat all the holes that they are living in with Drione dust to kill the bees and larvae and chink the holes. Then we add a product called bug juice to the stain when we apply it to the logs or cedar siding. The bug juice will deter the bees from eating new holes into the wood. If the damage is more severe we will replace the siding with new log or cedar in that area to refresh the look of the house. In some cases we will apply a borate solution to the home prior to staining which will keep wood boring insects from destroying the wood. Our log home has areas that water is causing rot or the woodpeckers have made holes in the logs—what can we do? We can reface the damaged logs by cutting out the front portion of the log as deep as the damage is in the log. Then we put new log siding to match the contour of your logs so the repair blends in with the other logs. Then we chink around the repair to prevent water from entering into the repaired area. When getting my shingle roof replaced how do I know what products the roofer should be using? This is a very important question to ensure that your new roof performs as it should and allows you to get the maximum life expectancy from your new shingles. Having your roof replaced can be a large financial investment and something that you will live with for many years to come. All of the products that I will be discussing are not only a vital part of the functionality of your roof, but are also required by the shingle manufacturers and your local building codes. First and foremost after the old roof is removed is the installation of a self–sealing ice and water shield per local building codes. This is a product that is installed on the bottom edges and in your valleys. In new construction and reroofing ice and water shield is required to be installed on the bottom edges which spans a minimum of 2' inside the thermal envelope of your home. Basically that means if you would extend the exterior walls of your home above the roof line the ice and water shield would need to extend a minimum of 2' beyond that point. This applies to all heated areas of your home. This product is designed to help deter ice back up during the winter months. I also mentioned ice and water shield to be used as a valley liner. Whether you go with exposed metal valleys or closed valleys where the shingles become your valley this should be installed first. The next product that would be installed is the underlayment. The purpose of an underlayment is to act as a vapor barrier. Basically when the warm air from the inside meets the cold shingles (or vice versa in the summer) condensation can form between the shingles and your roof sheeting. The underlayment acts as a barrier so that the moisture does not get to the roof decking. The most common underlayment and what most shingle manufacturers specify is a 15 lb. asphalt roofing felt. There is also a 30 lb. felt and synthetic underlayment available, but keep in mind these products are more money and do not give you a better roof. Aluminum drip edging should be installed on all roof edges. They make edging in a variety of colors so that the roofer can match your existing trim color to give you a nice finished appearance. Next would be the shingles themselves. There are many types of shingles available, but for this question I am going to focus on one particular style. This would be the architectural or also known as 3-Dimensional shingles. All architectural shingles consist of a fiberglass mat which is saturated in asphalt on both sides and then colored granules applied to the top surface. There are multiple manufacturers of this style shingle with a wide variety of colors available. The one thing to make sure of is that your roofing professional fully explains the warranty and what it means to you. The last product I am going to discuss is ridge vent. This is a very important product when it comes to the longevity of your roof. Excessive heat buildup over the summer and condensation over the winter are two major enemies of your roof. Ridge vent is meant to create a non–powered air flow between the bottom edge soffit and the ridge vent. The ridge vent that is most effective in accomplishing this is one that has an external baffle. There are aluminum styles and shingle over styles available which both have the external baffles. There are also many ridge vents available that do not have the external baffle so make sure you question which style is being used. When getting a new shingle roof you should make sure that all of these products are being used, as well as a qualified roofing professional installing them. We at M&E Roofing, LLC would be happy to help you with any and all of your home improvement needs including your new roof. Please give us a call at 717-626-4253. With fall approaching comes my annual chore of cleaning up leaves. While I'm okay with raking the yard, I'm getting too old (and perhaps a little too heavy) to be climbing a ladder to clean out rain gutters. And while my grown kids have offered to help, I'm not comfortable with them on a ladder either. Suggestions? Your safety concern is understandable. According to the Consumer Product Safety Commission, thousands of people are treated for broken bones, bruises and cuts from ladder injuries every year; many are permanently injured including paralysis, and over 300 people die of ladder related injuries. Not good. Another thing that's not good is ignoring the problem. Clogged rain gutters and spouts can do serious damage to your home—including soffit, fascia, wall, and foundation damage. Repairing these problems can be VERY costly. And don't think that you'd be better off by simply removing your gutter system. Although such a move would certainly relieve you of your annual gutter cleaning duties—you'd be doing it at a very high risk of serious damage to your foundation. If you don't have water in your basement already, more than likely, you soon will. Paying someone else to clean your gutters is an option—but it won't be cheap and it'll be an ongoing expense. And don't forget to consider the liability issue in the event of an accident. You may very well be liable. The solution for you is a gutter system called LeafX™. The LeafX™ closed–system design ensures that your gutters won�t clog with debris or allow moisture to ruin your home. And, LeafX™ is guaranteed to work for life—providing it is installed by an authorized installation specialist (such as my company, Ralph L. Wilhelm Jr., Inc. Seamless Spouting). LeafX™ has a lifetime No–Clog Guarantee for your gutters as well as a lifetime Finish Warranty. And, both the guarantee and warranty are fully transferable should you ever sell your home. • unobstructed gutters allows water to flow freely—handling even the biggest rainfalls on record. As for cost, I think you'd be surprised at how affordable LeafX™ actually is. My personal feeling is that LeafX™ is the best value of any premium gutter protection system on the market. For more information, don't hesitate to give me a call 717.548.2322 or visit me and my display booth at one of the upcoming home shows.In the meantime, if you must get on a ladder...be very careful! My roof is only 17 years old but it has black "streaky" looking stains all over it, especially on the north side (the side facing my street of course!) What exactly are these stains, and how can I get rid of them? We've all seen it, those dark black streaks on a roof. Sometimes they look more like ugly blotches than streaks, but either way they don't do a lot for the appearance of a house. The black streaking and staining is actually algae or fungal growth. It begins when a small spore lands on your roof and takes up residence. Over time it often spreads and grows. Typically, you'll notice the staining on the north-facing sides of a home or on roof sections that get a lot of shade. However, it is not necessarily limited to those areas and I have seen it many times on south-facing, sunny roof sections as well. This type of staining seems to have become much more prevalent in the last 10-20 years in our area. Some say that this can be attributed to the increased use of crushed limestone as filler in roofing shingles. The calcium carbonate in limestone supports algae growth. Most new shingles come with some type of warranty against staining, usually lasting 5-15 years. Shingles are generally manufactured with zinc or copper granules mixed in with the colored stone granules. When it rains the zinc or copper are released and inhibit algae growth. Zinc or copper are expensive additives so adding enough to prevent staining for the life of the shingle would simply make the roof cost too much. In most cases, using a safe, manufacturer recommended cleaning solution, combined with a low-pressure rinse, algae stains can be removed from your roof without damaging the shingles. Your roof can actually look new again! The "ideal candidates" are roofs that are in fair condition or better. If your shingles have aged to the point where we feel that they may not be able to handle the low-pressure rinse, we won't attempt to clean them, not to mention the fact that it may not be a wise investment if your roof needs to be replaced within a few years. Costs will vary greatly depending on factors such as; roof size, roof pitch (steepness), and degree of staining among other things. Also, we do not guarantee that the stains won't return. However, in most cases it took years for the black staining to grow to the level where it is on many roofs. If you notice new staining, it can typically be removed easily and inexpensively, without having to clean the entire roof. Another option is to install new zinc strips that will prevent new algae growth. There are thousands of homes with roofs like yours in our area—roofs that have lots of life left in them but that appear old, worn, and downright ugly due to algae staining. Cleaning roofs like this can be a great way to restore curb appeal. It's also a smart idea for folks looking to sell their home. Even though the functionality of the roof may be top-notch, if it appears worn out it can put a lot of caution flags into a potential buyer's mind. If you'd like us to take a look at your roof to determine if it's a good candidate for a roof cleaning, don't hesitate to give us a call. We don't charge for estimates and our roofing professionals will give you an honest answer as to the best course of action for your home. My husband and I are about to replace our roof. We have concerns about product warranty and product durability to name just a few. The only thing we are certain about is that our roof definitely needs replaced. As consumers who don’t have the slightest idea of what is involved or what to look out for, what advise can you give us? Your roof is designed to protect your home from the elements. Too many homeowners take their roof for granted and don't act until a problem has surfaced. By then, serious home damage may have occurred. Another function of your roof is to aid in heating and cooling. A new roof that has adequate insulation and is made from efficient materials prevents hot air from escaping as it rises to the attic, reducing your need for home heating. This saves money on heating fuel and helps the environment since you'll use less gas, oil or electricity to keep your home warm. One thing that many homeowners overlook is that your choice of roofing material can have a long-term impact on your energy costs. The sun's rays beat down on your roof all day and cause the roof and attic to heat up. This in turn causes your air conditioner to work overtime keeping your home cool. Some roofing products do a better job at reflecting the sun's rays, keeping the attic cooler and giving your air conditioning system a break. Studies have shown that white or light colored roofing can keep your attic temperature significantly lower and reduce energy costs for cooling your home by nearly a third. Energy-saving asphalt shingle manufacturers have recently started using high-tech ceramic granules on their shingles that are designed to reflect the sun's rays. Many of these shingles are so effective at reducing energy costs that they have earned an Energy Star rating. As far as your situation is concerned, the first step is to have a professional walk the perimeter of your roof looking for the proper ventilation (breathing is what we call it). They will then go on the roof and inspect all flashing's (notorious leak sources), making sure that all edge metals are properly functioning, checking any valleys and or crickets are working and are installed properly (these are where angles change and the water, snow, ice, and debris will accumulate). Next should be a visual inspection of your interior walls, ceilings, skylights, or other through roof penetrations. You should also check your attic and inspect for any apparent structural issues, water damage, mold, and any other roofing related concerns. Once all of the above is completed, have your chosen professional go over the issues of the roof, the suggested solutions and the recommended products. The entire roof system and the products installed should be covered by the manufacturer's warranty and as in most cases the better the product the better the warranty. Keep in mind that the entire system must be installed to the manufacturer's specs and also the system must be installed by certified installers. The most important thing to remember is your roof is only as good as the installer who installs it. Since the guarantee for a 30-year roof is contingent upon proper installation, it's critical that your installers know what they're doing. While short cuts give the industry a bad mark—they give homeowners their worst nightmare. For more information, please give us a call at 569.3700 or, better yet, come visit us and browse through our showroom while you're here! I'm tired of cleaning out my gutters every fall but there are so many gutter protection products on the market that I'm not sure which one is best for me. How do I decide? Over the years I'm sure many of you have dealt with the headache of repairing a clogged gutter or downspout or faced the frightening prospect of the annual gutter cleaning event, braving an old, rickety ladder or steep roof edge and risking a broken leg (or worse). While these tasks are thankless (no one notices that your gutters are clean and working well), dirty, and often dangerous, they are very important. Why? Because WATER KILLS HOUSES! Plain and simple. Gutters that aren't functioning properly can lead to all kinds of problems, like rotted face boards and roof edges, wet and moldy basements and washed out landscaping and yards, just to name a few! So how do we keep the water flowing through our gutters and away from our houses without going through all that risk and pain? The solution is proper gutter protection...a product that keeps debris from piling up and clogging up your gutters in the first place. What is that product? Well, it seems that everyone has a solution. At last count I'm told there are over 80 gutter protection products on the market—and counting. It's a bit mind boggling! Ask your contractor to give you several references that have had the product installed on their home or business for at least 1 year. If they are unable to do so, don't buy their product! Cost. I'm amazed at what some people pay for their gutter protection! There are plenty of products out there that work effectively but don't cost you an exorbitant amount. Get 2 or 3 quotes from reputable contractors before signing! Aesthetics. Many of the products on the market are large, bulky and plain down ugly. They can significantly detract from your home's appearance. Make sure you understand how the product will look on your home after it is installed. Roof Connection. At Eby Exteriors we are also roofers. We know that it is best to leave the bottom edge of your roof un-tampered. Many gutter protection products are designed to slide under the shingles. This can cause the bottom edge of your roof to be more susceptible to wind-blown shingle loss. If there are ever shingles blown from the edge, the shingle manufacturer typically will not warrant the problem because the original roofing system has been altered. Warranty. Does the product have a warranty? Does the contractor offer a workmanship warranty? Are they in writing? It's important to know that you have a manufacturer and a contractor that will stand behind the product being installed. Feel free to contact us if you would like to see our selection of gutter protection products. You can come to our showroom in Akron or we'd be happy to visit your home or place of business. And as always we offer free, no obligation quotes. I'm tired of my home's drab appearance but I don't have a lot of money to spend. How can I enhance the look of my home's exterior without breaking my budget? There are many ways to dress up the exterior of your home without spending a lot of money! I routinely notice homes that with a few inexpensive exterior changes could easily go from ordinary to eye-catching. Beyond the personal enjoyment of feeling good about how your house looks, improving your home's appearance will most likely increase its value. The added curb appeal could more than pay for the cost of the improvement. With that in mind, I'd like to share a few of the more popular, low-cost ideas that we use to create better-looking homes all over central PA.
Add Specialty Roofing. Small sections like a bay/bow window, a porch roof, or a "pent" roof provide an ideal location for a specialty roofing product. Standing-seam copper or steel, synthetic slate shingles, or designer luxury shingles in a variety of colors can provide a beautiful accent to the front of your home. Add Specialty Siding. A front porch and reverse gable in the front of your home are great places to add a specialty siding like cedar shakes, scalloped shakes, or board and batten siding. The definition and character that specialty siding provides will add a huge "wow" factor to your home's appearance. Replace your Front Door and/or Storm Door. For most homes, the front door is the focal point of the house! New doors are surprisingly inexpensive and they can dramatically improve the aesthetics of your home! The styles and options are almost limitless. Also, many homes have an attractive front door that is covered up by an old, unattractive storm door. Adding a new "full-view" storm door in a color that matches or enhances your entry door can do wonders for your home's appearance. Again, for both of these options, you will most likely increase your energy efficiency as well. Add or Replace Shutters. Shutters are a great way to add color and definition to a home. They are easily installed and come in a wide variety of refinished colors that will never need to be painted. Styles include louvered, raised-panel, board and batten and more. Arched or elliptical tops can be added to match similar windows. Decorative pieces such as "S" hooks and hinges can also be added to enhance an authentic, traditional look. Add Window and Door Headers and Surrounds. Headers and surrounds can take an ordinary-looking window or door and give it character and class. These options are available in a large selection of pre-finished colors and styles. Surround profiles can be subtle with a basic flat option or molded profiles and keystones can be used to add more flair. Overhead garage doors, which often dominate the front of a home, can be greatly enhanced with the addition of a surround system such as a wide header with a keystone and fluted pilasters along the sides. These are just a few of the possibilities that can be employed to increase your home's curb appeal without spending a lot of money. Most of them can also be done with minimal intrusion into your home and your lifestyle. At Eby Exteriors, Inc., we gain a lot of satisfaction from improving the appearance of the homes we are privileged to work on! We'd love the opportunity to meet with you and share some ideas as to how we can take YOUR HOME from ordinary to EXTRAORDINARY. (717) 733-9142 ebyexteriors.com Route 272, Akron. How can I tell if my roof needs to be replaced or simply repaired? And should I be concerned about the employees a contractor is sending to work on my home? Regarding roof repair versus replacement, all homeowners struggle with this question. Your roof always appears to be doing its job of keeping you dry, but its color may be fading a bit. On the other hand, you might be noticing some dark spots, or some other ominous sign that has you wondering about your roof. Regardless, before calling roofers and having them bid on a roof replacement, you can do a little of your own research. The web site www.repairvsreplace.com is an incredible tool that can give you a general idea of the status of your roof. Before logging onto the site, take a few moments to walk around your home and assess your roof. Afterwards, take the seven-question quiz on repairvsreplace.com. In just minutes, you will be given an idea of whether your roof is healthy, may require some repair, or should be replaced immediately. It's important to note—if your roof is beginning to look a little ragged or you’re questioning whether it should be replaced—you should have it inspected. In fact, the National Roofing Contractors Association recommends you have this performed at least once a year. While your home may not appear to be leaking now, spots and discoloration can be signs that a leak is beginning. Repairvsreplace.com also is a great resource to find qualified roofing companies who can perform these inspections honestly and give you a true status report of your roof. On the issue of who is doing the work, our recommendation is don't trust your home to just anyone! Look for the Technician Seal of Safety. Inviting a contractor or service employee into your home is an important event. Why? Well, you’ve heard it on the news from time to time—someone assaulted in their home, or family heirlooms go missing after a service call. How do you protect against strangers taking advantage of you while in your home? Look for the Seal of Safety! What is the Seal of Safety? It means three things: first, all employees are subject to periodic drug-screening; second, employees go through an intensive criminal background check as part of the hiring process; and third, each employee is professionally trained to be "best in the business." Making sure your family and home are safe and secure during a service visit is a very important part of what Hackman Roofing does. Look for the Seal of Safety on their employees' identification cards. Better yet, DEMAND the Seal of Safety from anyone entering your home on any service call. There are many factors to consider in selecting a roofing contractor. Rest assured that safety, service and quality workmanship are all important parts of what HACKMAN Roofing • Siding • Spouting will bring to your home—along with a guaranteed solution to your roofing problems. Discover how easily you can experience the HACKMAN Roofing • Siding • Spouting way of doing business. Call 717-367-2348, today! What are some of the benefits of stamped concrete and a few questions to ask your concrete contractor before you choose who you want to install your stamped patio? 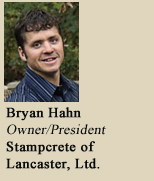 Answer provided by: Bryan Hahn, Owner/President, Stampcrete of Lancaster, Ltd. Stamped concrete is very durable. Concrete has been around for a long time because of its durability & strength. The next time you are on a main highway take note that it is probably made of concrete. In the south a lot of driveways are made of concrete since it is cooler and more durable than blacktop. Stamped concrete has come a long way in duplicating the look of many hardscapes for considerable less cost than for example real flagstone or brick. There are many border and Patina staining options to give your patio your own personal fl air or character. Stamped concrete is typically installed in about half the time of a deck or hardscapes so you can enjoy your patio investment sooner rather than later. As for maintenance there is the reseal every 2-3 years that needs done to protect and retain the original beauty. The sealer has other benefits as well. It keeps moss from growing on your patio, which can be an issue with real hardscapes, causing it to become slippery, because a sealer is not applied periodically. Plus the mortar in some hardscapes will deteriorate over time and pieces of stone or slate become loose and create a tripping hazard. With regards to stamped concrete installation and product quality, we recommend a 4000 psiconcrete mix, a rebar mat, fibermesh, and 2 coats of sealer. Make sure there is a 4-6 inch compacted clean stone base put down prior to installing concrete. A solid base is as important to your patio as footers are to your house foundation. Also insist that your concrete contractor use an anti skid in both coats of sealer otherwise the concrete will be a slipping hazard when wet. a little more up front and only takes a little more time & care to produce a quality job. Poor workmanship with concrete can typically only be corrected by removal and starting over. Research your concrete contractor well before choosing one. As with all types of businesses, there are a lot of “here today and gone tomorrow” concrete installers. Building a business with quality and relationships as the 1st priority will mean a happy customer and a growing company; this is what we strive for at Stampcrete of Lancaster. How do I care for my new asphalt driveway? Answer provided by: Jay Miller, Director of Paving Sales, B.R. Kreider & Son, Inc.
Asphalt pavement needs time to cure, typically 18-24 months. During this time the oils that make up the asphalt pavement will remain soft and pliable on the surface, especially on hot and humid days. Once the new pavement has been installed, we recommend that you keep any vehicles off of your new pavement for a minimum of 3 days to a week, unless special considerations are discussed. When using your new driveway, take care not to turn your vehicle wheels back and forth while in a stationary position or make sharp turns. Radial tires will often grip the surface of the pavement and ‘tear’ the surface, leaving noticeable marks. This is referred to as ‘tire scuffing.’ Tire scuffing on new asphalt pavement is generally minor, and while it looks rather severe, it will heal in time. One would have a difficult time actually finding these scuff locations later in the life of the pavement. Whenever possible, avoid gasoline and oil spills on your new asphalt surface. If this should occur, a degreasing product such as Simple Green or another comparable water-based product can be used to assist in cleaning the surface. Gasoline and oil will soften and breakdown the oils that make up your asphalt driveway and cause premature deterioration of your pavement surface, which may need attention from an asphalt installer. Beware of placing heavy objects such as jacks, motorcycle kickstands, etc. directly on the pavement. We recommend placing a piece of plywood on the surface of the paving to more evenly distribute the weight of the object you wish to place on the asphalt surface. With regard to asphalt sealers, we recommend that you wait to seal your new driveway until the pavement has had two full years to cure. Applying sealers to the surface of asphalt does not guarantee increased longer life of your asphalt surface. Sealers are primarily used to blacken or paint asphalt pavement, which has aged and has become ‘bleached’ by the sun where the oils become less pliable and hairline cracks may result. Thus, sealers are used to cover over these cracks, but in time these cracks may reappear again as the pavement ages. It is important to know that applying driveway sealers too often may result in premature deterioration of your driveway. So the question often debated is: do I put money into sealing my drive every couple years or do I save that money and invest it in an asphalt overlay when my drive is showing age and distress after 10 -15 years? People often want to dress up their black or faded asphalt driveway to compliment their landscaping and home. A new decorative product known as “Street Print” is an alternative to consider. ‘Street Print’ is an imprinted design installed in the asphalt pavement, which offers various shapes and patterns of brick and stone. A colored sealer coating is then added to the surface to create a highly attractive asphalt driveway. It offers an affordable enhancement to any homeowner's property. A paved surface area is an investment that should last a long time. Quality and careful application is critical for longevity. As you are considering the condition of your paved surface, we invite you to cal lour Paving Sales department at B.R. Kreider & Son, Inc. and visit our web site at www.brkreider.com.